Building upon our earlier maps of rich and poor, we were curious whether there was much difference between user generated references to slum, ghetto and poverty. 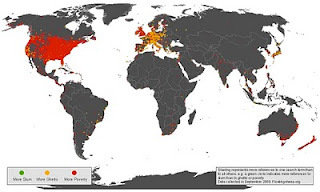 As the global map below indicates the differences seem to be primarily based on language with English speaking countries (U.S., Canada, the U.K. Australia and New Zealand) where references to poverty dominate. This difference becomes clearer as one zooms into the European regional level where references to ghetto appear to be most prevalent in non-English speaking zones. It is likely that this is tied to ghetto being a more internationalized term than poverty and thus shows up more outside the Anglophone world. But overall one can see that these particular search terms are not used ubiquitously across language groups, highlighting again the importance of using non-linguistic keywords for search, e.g., the number 1, or words that are generally unchanged across space. For example, maps of the names of well know international figures like "paris hilton"  or "osama bin laden" (this is probably the first time those two have been in the same sentence!). Looking at North America therefore is helpful as it represents largely English speaking (apologies to Quebec and Mexico). While it is clear that there are more mentions of poverty than either slum or ghetto there are some intriguing patterns. For example, places where references to slum are the most prevalent are relatively rare but do seem to correspond with poor areas such as Watts in Los Angeles and some neighborhoods in Philadelphia and New York. 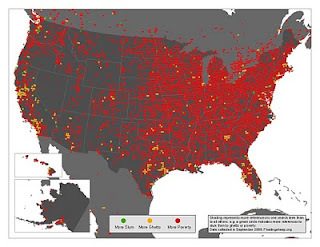 The term ghetto also appears to be most frequent in urban settings (although not all) with the cities of Tampa, Gainesville, Atlanta, Dallas, Houston, San Antonio, Phoenix, Oakland and Sacramento representing clusters. Since the term poverty greatly overshadows occurrences of slum or ghetto we also generated a map which just those terms. 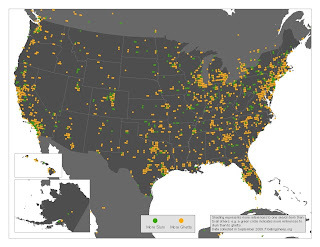 It is not clear why these differences are here but may simple point to regional linguist preferences with the U.S.
Again, this mapping does not signifying a particular economic fortune in any one area but the prevalence of an array of terms associated with economically disadvantaged areas. Still it produces some intriguing patterns. Which of course bring up its own problems in the city of Paris and the Hilton Hotel. Maybe we should try Nicole Richie instead? Why is it not Showing Bombay or India? T-shirts, Ties and Beer Steins!